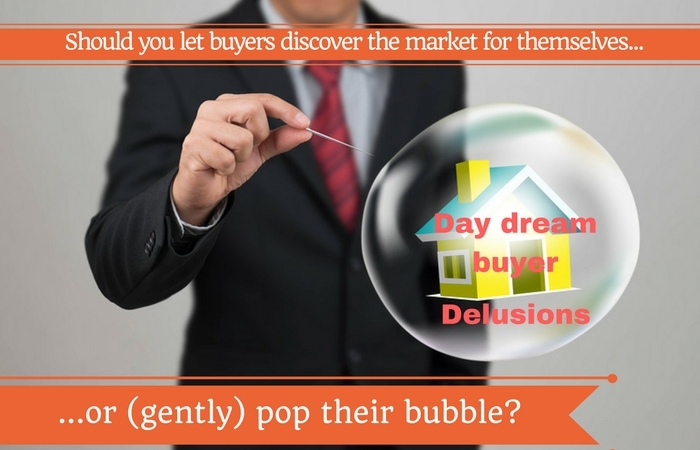 Let home buyers discover the market for themselves or pop their dream bubble? Recently I listed a home which received multiple offers on the offer review deadline. Two of the 8 offers were actually below asking price and with the full spectrum of buyer contingencies. After the sellers had picked the winning offer, I then set upon one of the less appealing aspects of real estate... calling the agents whose buyers didn't get the home. Yes, text or email would be easier but since the agent and their buyers went to the trouble of making an offer they deserved a phone call. When I asked the agents for the low ball offers…”Why did your buyers make below list price offers knowing that there were already a bunch of other offers?" The agents replied: “I wanted the buyers to discover for themselves how strong a sellers’ market we are in right now, plus we got to practice writing up an offer”. Some home buyers have an HGTV inspired impression of finding and purchasing a home. “Let’s go see 3 homes and then we can decide which one we want to buy”. Ah yes, fantasy real estate land where everything is staged and not just the homes. Buying a home is not like purchasing a TV…get to check out multiple models, then go home for a week and think about it, sleep soundly knowing that the same TV will be there in a week if you decide you want to buy it. In a strong sellers’ market or even a balanced real estate market, luxuries such as time are not always available. As a Realtor, you have to decide whether to let home buyers discover for themselves what the real estate market is really like or, do you give it to them straight on day zero and risk never seeing them again as they run screaming into the horizon?